Ralph Nelson was one of the prolific directors of live television in the ’50s, yet when he made the transition to theatrical features – beginning with the big screen version of his award-winning Playhouse 90 production of Rod Serling’s Requiem for a Heavyweight – he never managed to establish himself as a major figure like his contemporaries John Frankenheimer or Franklin J. Schaffner. Although he did well with actors, his work was often competent rather than imaginative or innovative (Fate Is the Hunter, Charly, Soldier Blue, The Wilby Conspiracy). In short, he was more a craftsman than an auteur. And yet, his most successful film was a project which he was so passionate about that he largely funded it himself by mortgaging his own house (something anathema to Hollywood) when he was unable to secure any serious backing from producers or distributors … and this despite having proved himself with the success of the previous year’s Requiem. But it’s not hard to understand industry hesitation. 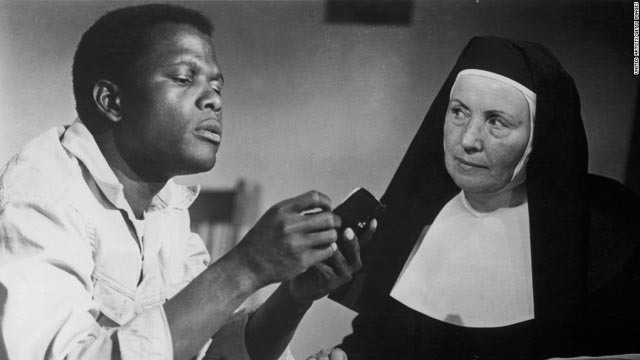 Lilies of the Field (1963), based on a novella by William E. Barrett, adapted by the versatile James Poe, is a parable about faith and redemption with a subtext touching on race relations in the years leading up to the civil rights upheavals of the ’60s. The simple story focuses on a Black man driving across the southwest in a station wagon which serves as his home and mobile workshop. Needing water for his overheating radiator, Homer Smith (Sidney Poitier) pulls in at the first place he sees in the desert. This turns out to be the home of a small group of nuns who have apparently fled communist oppression in postwar Europe. 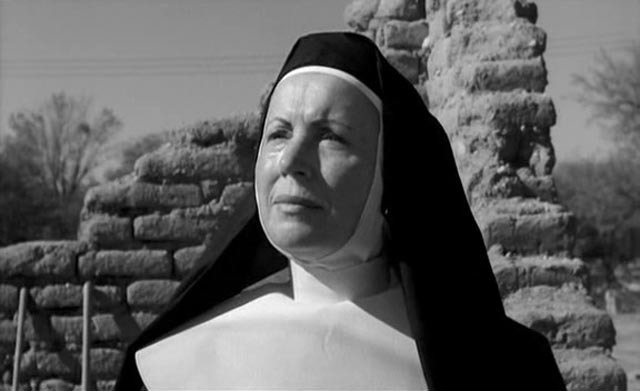 A battle of wills immediately begins, with Mother Maria (Lilia Skala) seeing Homer as Heaven-sent to assist the sisters in the building of a small chapel to serve the local Catholic community. The easy-going Homer is no match for her iron will and as he finds it impossible to extricate himself from her increasing demands, his own sense of pride gradually takes over and his own desire to be creative rises to the challenge. Although the friction between them drives him away at one point, he returns to finish the job, eventually readjusting his pride to accept help from the local Hispanic community to complete the chapel. Remarkably, with a budget of only a couple of hundred thousand dollars, the film – including the construction and completion of the adobe chapel – was shot in just two weeks. Despite its modesty, Lilies of the Field achieved historical significance when Poitier won the first leading actor Oscar awarded to a Black actor. (He had previously been nominated for Stanley Kramer’s The Defiant Ones .) Paradoxically, this was the film which established Poitier’s image as a “safe” Black star, an image which came to be a burden within a decade as other, edgier actors began to achieve success. And yet the success of those who followed him could arguably be said to have been dependent on Poitier’s making Black stars seem viable to a conservative industry. Yet, if this element now seems a bit uncomfortable to watch, Lilies of the Field offers a few other interesting points considering when it was made. 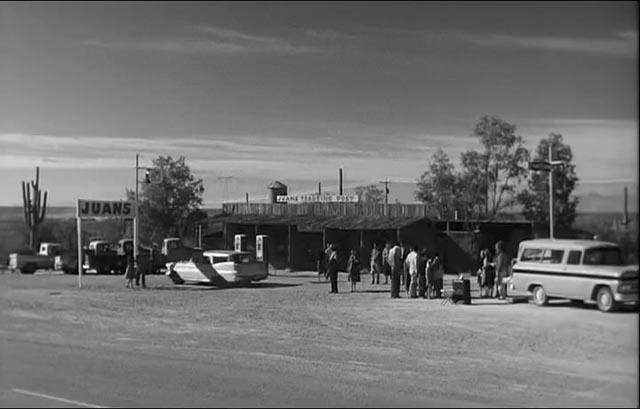 Although there is little overt racism expressed in the film, there are a few coded exchanges involving the local contractor Mr. Ashton (an uncredited Ralph Nelson), including a moment which prefigures In the Heat of the Night (1967): when Ashton casually refers to Homer as “boy” and dismisses him, Homer calls him back by calling the white man “boy” in turn. This would have seemed quite shocking to a contemporary audience conditioned to expect deference and subservience. Perhaps more significant is the depiction of the local community. 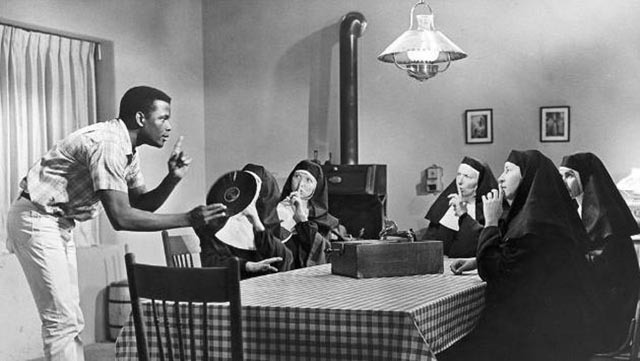 In addition to the immigrant/refugee nuns, the congregation of “whisky priest” Father Murphy (Dan Frazer) is largely Mexican, and these people accept and eventually help the Black Baptist Homer without any indication of hesitation or judgement. Even Ashton comes around and pitches in to help with the ongoing building of an inclusive community. Nelson handles his ensemble cast well, staving off the pitfalls of sentimentality by allowing the characters to remain somewhat prickly, even as they gain mutual respect and affection. Even the two scenes in which Homer gets the nuns to join in a rousing Baptist spiritual manage to avoid being cloying; in fact, the reiteration of the song at the end becomes an expression of all the emotions which have developed but can’t be openly expressed between Homer and Mother Maria. This scrappy low-budget feature looks and sounds quite good on Twilight Time’s Blu-ray. The commentary track by Nick Redman, Julie Kirgo and Lem Dobbs, while expressing their great affection for the film, does a good job in laying out the history and implications of the production. As usual with Twilight Time, the disk includes a music only track devoted to Jerry Goldsmith’s distinctive score. Like Ralph Nelson, Richard Fleischer was more versatile craftsman than auteur, working in a wide array of genres through a career which lasted four-and-a-half decades. After years of directing shorts, he made a number of taut noirs, then perhaps unexpectedly helmed what remains Disney’s greatest live-action success, 20,000 Leagues Under the Sea (1954). He made sprawling epics – The Vikings, Barabbas, Tora! Tora! Tora! ; the entertaining pulp sci-fi Fantastic Voyage; an attempt at future noir with Soylent Green; the big budget musical disaster Dr. Dolittle; and a few violent thrillers in the ’70s, along with the still underrated Mandingo. And over the years, he showed an interest in “true crime”, from The Girl in the Red Velvet Swing (1955), about the Evelyn Nesbit/Stanford White affair (also featured in Milos Forman’s Ragtime ); to Compulsion (1959), about the Leopold-Loeb case; to the problematic Boston Strangler (1968), which is somewhat hampered by an overuse of trendy (for the time) split-screen and an unquestioning assertion of Albert DeSalvo’s guilt despite numerous inconsistencies in his confession and his never actually being tried and convicted. 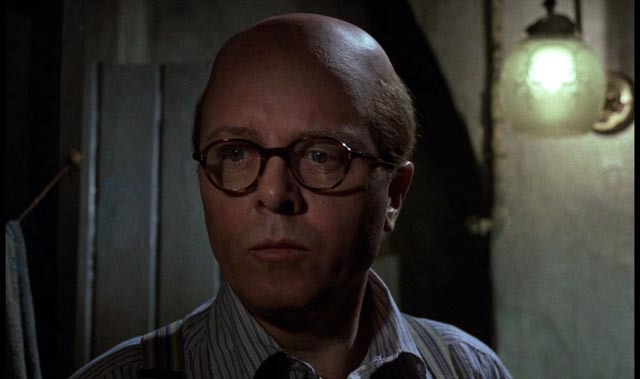 But Fleischer’s finest film in this vein, and arguably his best-directed film, is 10 Rillington Place (1971), a chillingly matter-of-fact treatment of the crimes of London serial killer John Reginald Christie (Richard Attenborough) and the conviction and execution of an innocent man for one of those crimes. Impeccably written by Clive Exton (from a book on the case by Ludovic Kennedy), this is a bleak and depressing movie which captures the atmosphere of England in the years following World War Two in which economic recovery was very slow and a lingering illusion of national gentility could conceal the acts of a vicious predator. 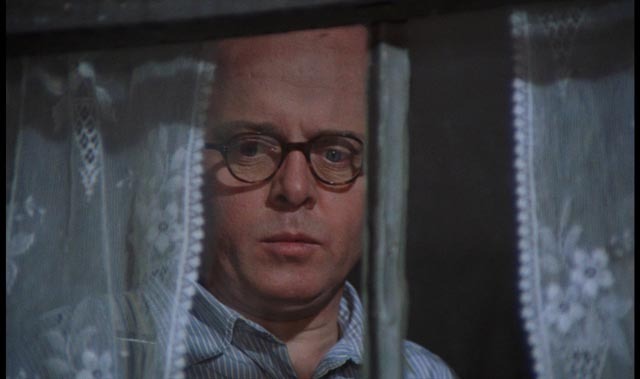 The film focuses on the case of Timothy and Beryl Evans, a struggling young couple who rent a couple of rooms in a row house on Rillington Place, where the superficially prissy Christie lives with his numbly oblivious wife Ethel (Pat Heywood). The couple have a young daughter and, we soon learn, another child on the way. 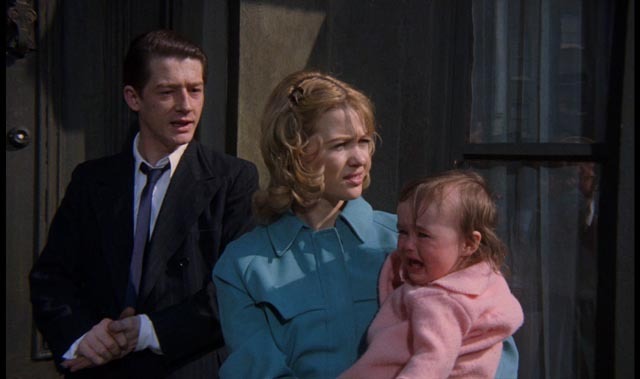 Timothy (John Hurt) is an illiterate, self-aggrandizing Welshman who struggles to make any kind of a living; deeply stressed, Beryl (Judy Geeson) wants to get rid of the baby, taking some medicine which fails to do the job. 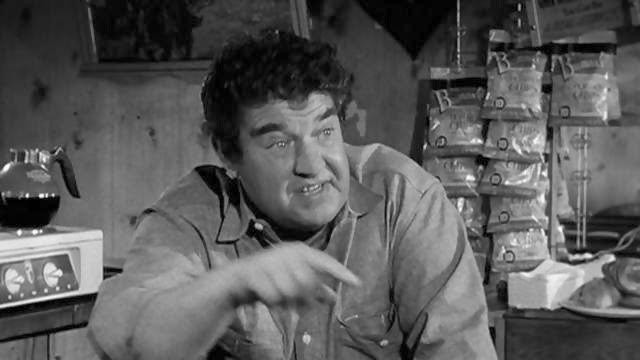 Christie, presenting himself as a man with medical training (a career he claims was stalled by the war, during which he served as an auxiliary policeman), offers to help the couple. Unfortunately, this is one of his devices for taking advantage of desperate women, whom he gases into unconsciousness and rapes while he strangles them. With Beryl dead, Christie has no difficulty in manipulating Timothy into incriminating himself, leading to one of the most famous miscarriages of British justice, a case which was instrumental in eventually getting the death penalty abolished. 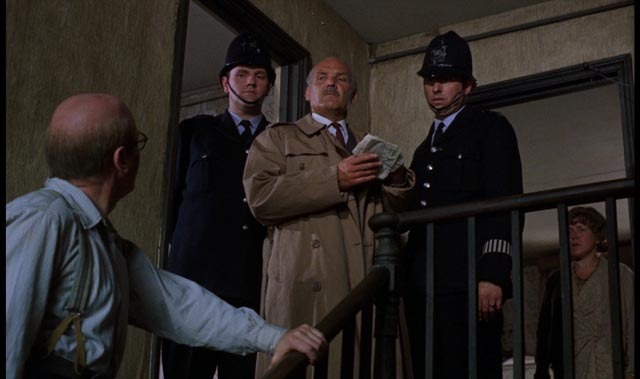 Appropriately for a film which offers no glimmer of hope, Denys Coop’s superb photography crowds the frame with gloom and shadows; even a sunny day seems oppressively dull, while interiors at night give us only suggestive glimpses of the unpleasant things going on. Script and direction resist any temptation to sentimentalize Christie’s victims – Timothy Evans is an abrasive, violent braggart whose arguments with Beryl reinforce everyone’s belief that he was capable of murder. Beryl is a sad, hopeless woman whose submission to Christie is heartbreaking as we know only too well what is about to happen to her. John Hurt and Judy Geeson give superb performances as the doomed couple, while Richard Attenborough gives the finest performance of his career as Christie, committing fully to a role which is the antithesis of his usual image, both as an actor and director. This is a chilling portrait of lower middle-class respectability as a veneer concealing pathological perversion. There is none of the glamour here of a Hannibal Lecter, just a sordid nobody snuffing out the lives of women forced into an untenable position by economic circumstance and oppressive laws. Twilight Time’s Blu-ray has a richly textured image with a film-like quality; the sound is spare, with a minimal score (only about ten minutes in total) by John Dankworth, relying on natural ambience and subtle effects. In addition to a trailer, which seems to show every major moment, there are two commentary tracks; one with John Hurt, ported over from an earlier DVD edition, the other with Nick Redman, Lem Dobbs and Judy Geeson (who’s becoming something of a Twilight Time regular, with previous contributions to the To Sir, With Love and Brannigan disks). Both tracks are well worth a listen, covering the actual case as well as the production, with both Hurt and Geeson having illuminating things to say about the craft of acting. This entry was posted in Review and tagged Actors, Adaptation, Crime, Directors, Docu-drama, Religious Films. Bookmark the permalink. I had no idea the director of my favorite as a kid also directed one of my favorites as an adult. I assume that means 20,000 Leagues Under the Sea was your favourite childhood movie?